that living room? swOon fAint tHud . . . . .
in other news, your cottage is precious draped in the white stuff! Nancy I could settle in as a house cat in this French cottage and never feel the need to leave. 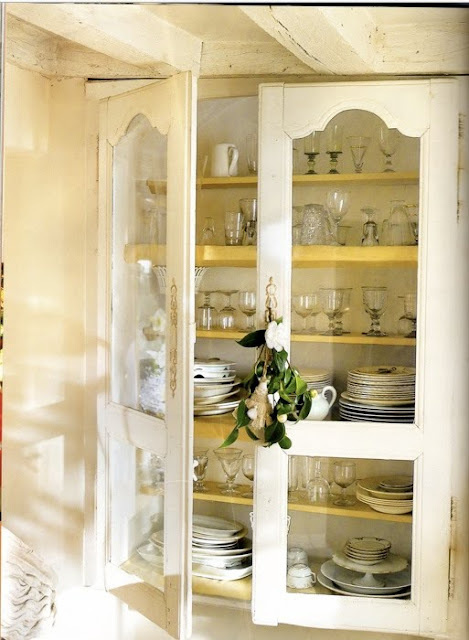 I find every thing in every room exquisitely gorgeous and all I'd ever need. Wishing you a Merry Christmas and a happy New Year, I post my winter theatrical presentation on Dec. 21st as my gift and will return to kick off my third year of blogging after the New Year. Nancy you have graced us this year and invited us in to your building of your pretty cottage and seeing the picture with snow brought a new appreciation of your charming home. It really is cute. Would be fun to vacation there. Your home looks beautiful in the snow, sort of Swedish. Perfect snow covered cottage. Well done. Oh la la Nancy. This one is too sweet. 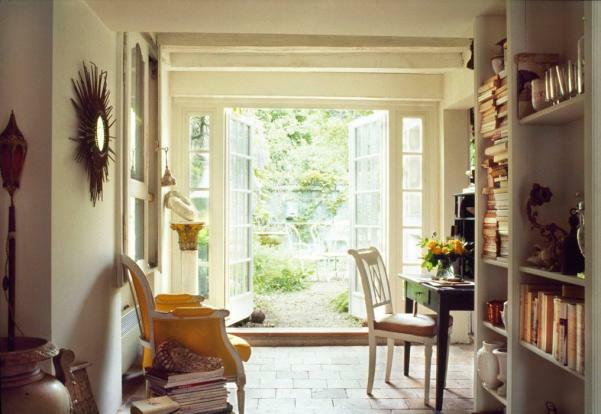 Love those french doors going out to the garden. So pretty. I have very much enjoyed all your Small Spaces posts. Seasons Best Wishes Nancy. I love seeing your home capped and surrounded by all that white. 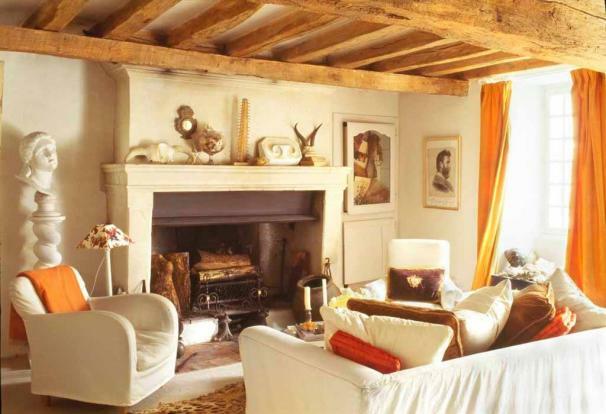 A French cottage is always a favorite, and this one is stunning. 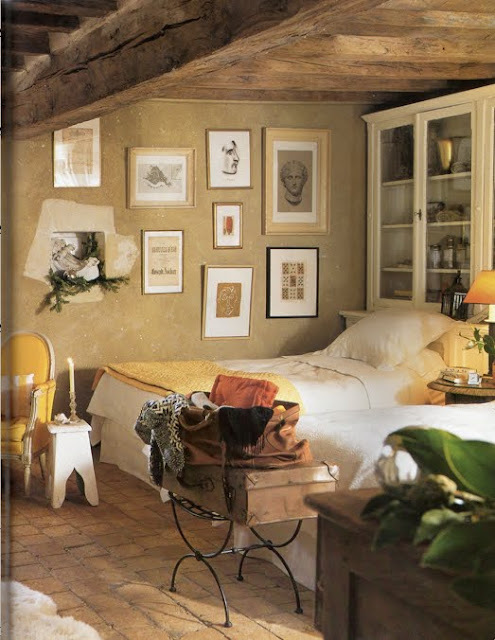 Exposed beams, terra cotta floors...the essentials let the details rest beautifully. 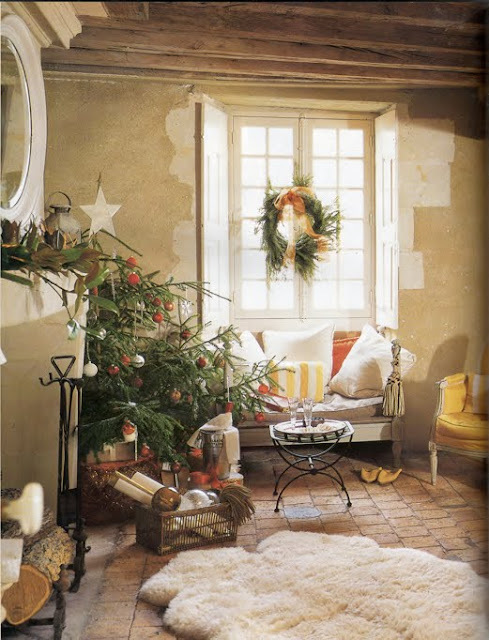 I love the way the French decorate for Christmas, using natural elements and keeping the colors almost neutral...again, letting natural elements do the driving. As for your GORGEOUS home, the red is perfectly nestled in white and it truly looks like a Scandinavian cottage! How we miss our snow....none yet, and we may not even get any for Christmas! I am so waiting for it, just to get some photos! Enjoy as we have FIVE days left! Your new cottage looks wonderful nestled in the snow. Yes, dreams do come true. What a lovely, old world cottage there in France. Thanks for this lovely series of posts you have done. They are enjoyable and inspiring. Have a wonderful Christmas and a glorious start to 2016 and a fantastic new year. Merry Christmas to you and yours..Thanks for finding this one..I could move there yesterday..it's WonderFul.!! your home is beautiful as well..no snow for us..but what else is new here on Maryland's eastern shore..calling for rain..4 days this week..yuck..Hope Santa treats you well.!! Thanks for your many visits and nice comments this past year, Wende. Merry Christmas to you and your family. Your red cottage looks so picturesque in the snowy setting! 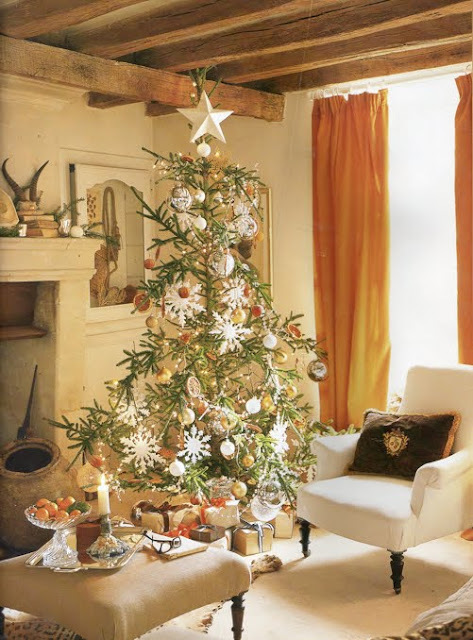 Enjoy your first Christmas in your new cottage! What a pretty place, so light and bright. Happy holidays, Nancy. What an amazing post, about a so charming place, a dream-cottage for me ! I'm so very glad to have found you and your blog, I'm following you with so much joy, believe me, I love everything talking about the past ! Lovely cottage... I feel like I need to spend some time in the Loire valley! Your cottage looks like it belongs to one of those films that depicts the perfect Christmas! oh Nancy thank you for stopping by for a visit so my return to this post would not have been missed. I dream of such a place more often then not, and I too live in a small place, living large in a small space. My home being under 1,400 square feet allows me to create uniquely in more ways then not. Coming from a larger 3,800 square feet and 1,400 live able attic space was way more then anyone needs. 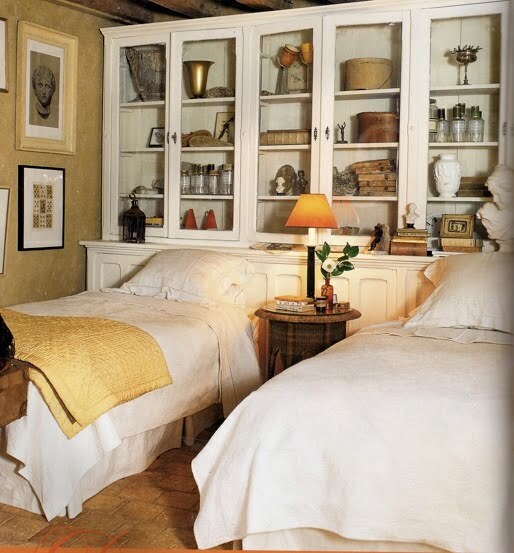 The real challenge was to weed out all that one does not need, and have the pieces of use and of beauty close at hand in a smaller investment home. I am not even sure if I could be comfortable again in such a large home. Your cottage I followed way back in its early stage of building and see that all your beautiful needs were met in living large in a seaminly smaller space. 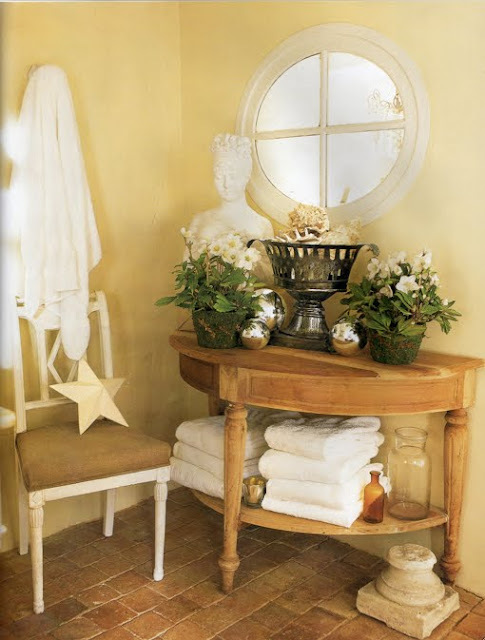 I had painted my front room floor with plans to tile more with a blend to what already is In The entryway, I could so do the paver look, yet perhaps tone of neutrals to blend with the larger tiles used in the entry. If I could do this place up all over again, I would pave with tile in every room giving it a flow of larger and a wonderful grounding for footsteps. Love this post, and I am going back to see more of what I have maybe missed in your cottage. Love it nested in all the white of snow... Your home feels like a Nordic Jeanne d Arc living, magazine featured home....love the red and white, it reminds me of Janet's home at the Gardeners Cottage she is on my side bar, her home was red and white, until this years make over where her small 960 square foot cottage took on a black and white exterior paint finish in Black bean soup. You must visit her she will charm you. Your cottage looks absolutely charming in the snow. It is a picture postcard of winter in the northwest! The cottage in France is not bad either! I could live and/or visit either one! Your home is beautiful. I know what you mean about the first snow. We haven't had any yet but anxious to see our new home in the snow. Love your cottage. The featured one is really pretty too. Happy Holidays. Thank you for dropping by. Merry Christmas to you, too! I don't blame you one bit for posting a photo of your little cottage covered in snow - it's so fun to see the first time!!! I LOVE this cottage, Nancy. The wood beams, tile floors, built in cabinetry, and fireplace ~ sigh, so beautiful! I'm wishing you & yours very happy Holidays! Thank you, Lin. Happy Holidays and much love to you, too! I loved seeing your sweet cottage in the snow. It's exactly as wonderful as I imagined it would be! Wishing you a very Merry Christmas with your sweet husband. I'll be back again to share more cottages with you. Including yours. Gracias. Espero que hayan tenido una hermosa Navidad. That is an adorable cottage, thanks for the look. Happy New Year!!! Thanks for your comment on my blog post. There are always so many interesting connections with people--my daughter lives in Ohio with her son! She and I both have small homes, too. Looking forward to continuing to read through your blog posts. 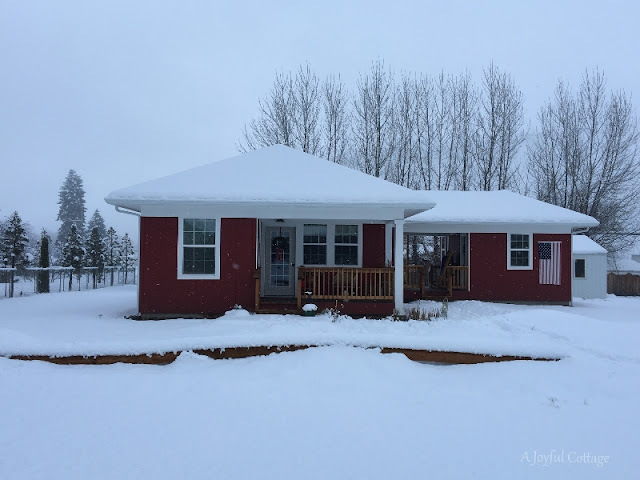 Your cottage looks so pretty in red, in the midst of all the snow! And the Loire Valley cottage? I'm ready to move in. The built-ins cupboards and the terra cotta floors, and the French doors onto the courtyard have me sold! Your Joyful Cottage home is simply gorgeous, I loved seeing it surrounded with snow! What a delight to follow with you through this year in all the steps that it took to get to this point.. such joy indeed! 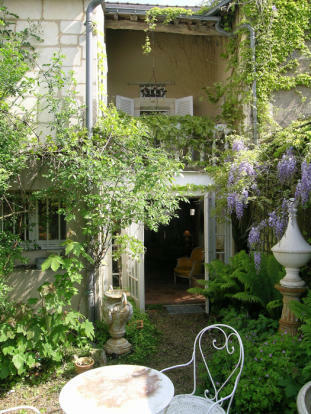 Enjoyed your post on the delightful Loire Valley cottage, just darling! I loved the open feel of the home, and missed seeing the kitchen, as you mentioned. The outdoor space was delightful as well! Another charming cottage you've shared today. 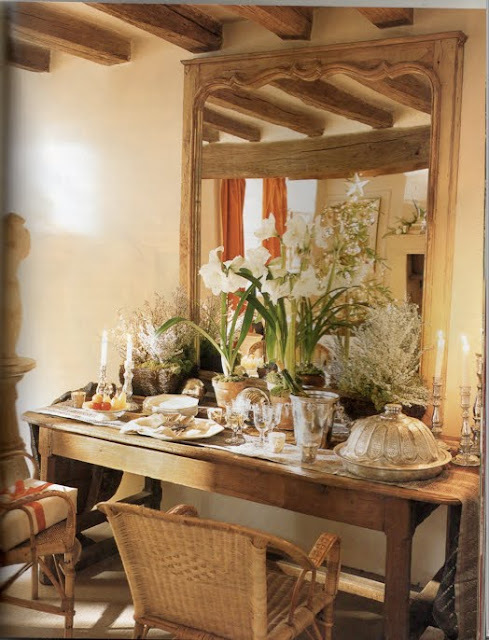 That photo looking out through the french windows of the cottage in France... swoon! Hope you and Dennis had a wonderful first Christmas in your new home! Wishing you all the best in 2016! I'm so glad our paths crossed this year! You're very observant, Anne. The photo is new. I'm glad our paths crossed, too. Praying good things for you in 2016. Nancy! Your brand new home looks amazing, love the beautiful vibrant colour. This French house is outstanding. How I'd love to live there. Thank you for all the sharing in 2015 and giving me the opportunity to share my own story. Hope your Christmas was joyous and meaningful and wishing you peace, joy and good health in 2016. Warm and inviting your cottage looks in the snow.